The XFL has unveiled a high-profile name as the head coach and general manager of its Dallas team. At a press event at Globe Life Park in Arlington, Texas today, XFL commissioner and CEO Oliver Luck officially named Bob Stoops as the head coach and GM of the league's Dallas team. 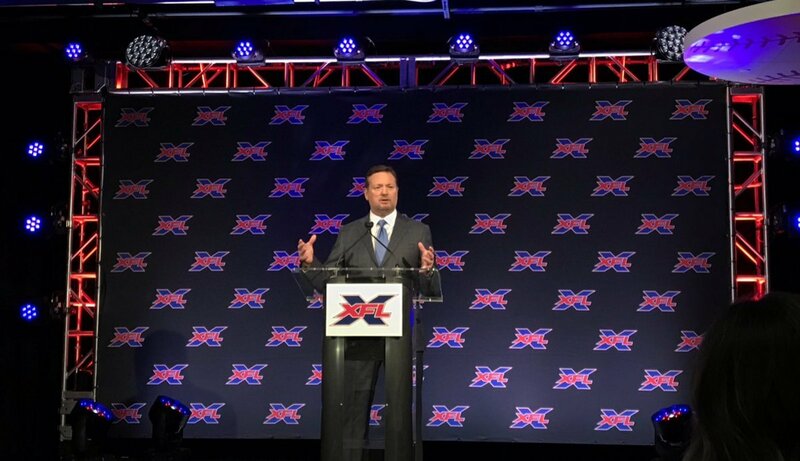 Stoops is the first coach/GM to be announced for the XFL's revival. The 58-year-old Stoops was the head coach of the Oklahoma Sooners from 1999-2016. During his time leading the team, the Sooners won the college football national championship once and won the Big 12 conference ten times. Stoops unexpectedly retired as the Sooners' coach in June 2017. Jim Ross, who is friends with Stoops, tweeted about the announcement: "Excited for this....Bob Stoops is one of my best pals." The first season of the revived XFL will begin on February 8-9, 2020, which is the weekend after next year's Super Bowl. There will be eight teams, with Dallas (Arlington), New York (East Rutherford, New Jersey), Houston, Los Angeles (Carson), St. Louis, Seattle, Tampa Bay, and Washington D.C. as the host cities for them. All of the head coaches will also be the GMs of the teams. The XFL has yet to announce a television deal, though Sports Business Journal reported last month that the XFL is in "deep" discussions on a deal that would see two thirds of the league's games air on Fox, FS1, ABC, and ESPN. Charlie Ebersol's Alliance of American Football, a competitor to the XFL, will kick off this Saturday.